He was speaking on “International Trade Facilitation Findings from Sri Lanka” at the International Conference on Benchmarking Sri Lanka’s Trade Facilitation at the Cinnamon Grand Hotel yesterday. He said that all customs related information should be readily available for those interested. The other recommendations included establishing pre-arrival manifest submission, reviewing the licensing procedures, conducting a study for a Public Private Partnership model for trade facilitation system, Online application and approval of OGA Licence and permit and establish a port community system. Koh also outlined three recommendations that had gained high effort - eliminating duplication of sampling by customs, establishing a national value added network framework and implementation of a single electronic window. Koh said that Sri Lanka is closer to the top half of various trade rankings compared with other countries and these recommendations can be implemented without any hassle. There may be resistance but people expect corruption to be eliminated, improve coordination, online submission and timely dissemination of rules and regulations. Advisor (Trade) Special Advisory Services Division, Commonwealth Secretariat Sujeevan Perera said the overall goal of Sri Lanka’s Trade Facilitation project is to enhance the competitiveness of Sri Lanka’s business environment through improvements to its trade facilitation systems and processes. 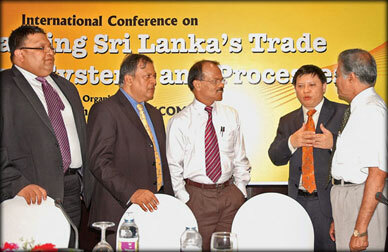 The international conference on Benchmarking Sri Lanka’s Trade Facilitation Systems marked the final event in the exercise of examining and analyzing the needs in the systems and methods of trade facilitation. Secretary, Ministry of Export Development and International Trade S. Rannuge also spoke.